Sunday catchup is late, I know, but that’s because…we have first draft sign! The first draft of Copper Cove is done! Review and rewriting will come shortly, but before long, the book should be ready to go! So, things are a bit short this week, but I wanted to mention that the people of Houston and the Texas Gulf Coast could use your help after Hurricane Harvey. The crowdfunding website Global Giving has set up a donation page to collect funds to assist area charities with both short-term and long-term needs. Please donate here, or to your other charity of choice. Thanks. I’m going to take a moment away from all the prep I’m doing for the next Monkey Queen book to talk to you about something important. A friend of mine needs your help. I first met Amber Goss when she wrote me fan mail about one of my short stories. She went on to read the Monkey Queen books, and has become a big supporter of Michiko and Beth. A class that her financial aid plan won’t cover. Amber’s started a GoFundMe page to help raise money to cover the costs of tuition and books for the December class, plus her application fees for graduate school. She’s looking to raise $2300 by December 1; any extra money raised will help cover her living expenses. She goes into detail there about her situation and what the funds will be used for. $2300 is a big amount. Money’s tight for everyone. People are nervous about the election and so many other things…but I’m not hesitating to pitch in. Amber’s not just a fan, but a true friend; she’s smart and sharp, she knows her geek stuff, she makes me laugh early and often, and she’s there with words of support and encouragement on the bad days. And this is Amber’s chance. A chance to graduate, to go to grad school to pursue her dream career, to make a living instead of struggling to get by, to make a difference in the world. But to do it, Amber needs your help. And I’m asking, imploring, all of you to pitch in. Please head to her GoFundMe page and donate. Even the smallest donation helps get her closer to her goal. And spread the word that a fellow Monkey Queen fan needs our help. Thanks for reading, and if you’re donating, a million thanks more. First, Francophone Fridays will return next week. Things have been crazy at my day job lately, and I haven’t been able to put in the time to get the next post done as it should be. I think it’s going to be a good one, so stay tuned! But we have something else to discuss. Every year, John Kovalic – the cartoonist behind the great gaming webcomic Dork Tower, and the gaming illustrator best known for his work on Munchkin – takes part in a bike ride to help a charity in his home of Madison, WI. Bike The Barns raises funds to help bring locally-grown organic food from farmers to needy families. That is one heck of a win-win. And every year, John sets a fundraising goal, reaches it, and bikes the entire 60 miles…with a duck on his head. This year, the goal is $7500. If he hits $10,000, he’ll also wear tentacles. You get all sorts of goodies for backing him, even if you don’t live anywhere near Wisconsin. A $20 donation will get you a Munchkin postcard, a “Army of Dorkness” button, two coloring book PDFs, and a PDF of a print with a duck limerick illustrated by John…and written by Patrick Rothfuss. And if you up the donation to $50, you get the art as an actual mini-print…signed by both John and Patrick. And even better, make a grown man wear a duck on his head. Again. Want some cool stuff? Want to help a good cause? Time to do both! 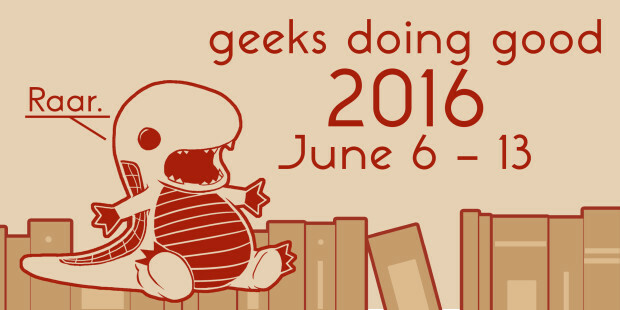 Worldbuilders, the organization that harnesses geek energy and good vibes to help great charities, has launched their annual Geeks Doing Good campaign on Indiegogo! Head over there to get lots of cool swag, with the proceeds going to charity! (I’ve got my eyes on that sweet Karen Hallion calendar, and OMG that coffee…) This campaign closes on June 13, though, so get over there now!